Lee Chatfield is a Freshman Republican representing a district in Michigan that includes my low income county, Chippewa, along with some of the richest counties in the state. His heart, he says, is with God, so naturally he ran as a Tea Party candidate. He works with the Republican majority to undermine crucial social programs in our beleaguered state because, I don't know--tough love, boot straps, nanny state, the poor don't need it, the rich do, sin, punishment, retribution, all of the above. He's young, good looking, clean-cut, has four small kids, a beautiful family, a nice life. He doesn't look mean or judgmental or even clueless. But he's a Republican in a state where meanness and intolerance are expected from his kind, so from what I know, he's toeing the mark, following the line, giving it all he's got to ignore the plight of the people he represents, justifying instead the GOP/Koch/ALEC/Mackinac Center assaults on the poor and the disenfranchised. But something happened that should, by all rights, make him reconsider the need to go on the attack against innocent people whose backgrounds he couldn't possibly understand: Last week his wife became the victim of a potential blackmailer. On Friday, Lee announced on Facebook that his wife, Stephanie, had a secret that was about to be exposed. When she was in high school she had an abortion. She went to a party, she doesn't know what happened, she became pregnant and she panicked. She had an abortion and she's regretted it ever since. I'm not here to judge Lee Chatfield's wife. This is her own personal business and she deserves the right to keep it quiet. But it's out in the open now and she and her husband handled it as well as could be expected. In the statement included on Chatfield's Facebook page, his wife Stephanie talked about the shame she felt and still feels. She talked about how her faith helped her through it. She talked about her pro-life stance and how it has made her more empathetic toward women who might find themselves in her shoes but who now need the kind of guidance that would keep them from having to abort their own babies. She asked for understanding. What she didn't talk about was the fact that her husband is a hard-headed proponent of killing off Planned Parenthood. Candidate Lee Chatfield at a Planned Parenthood protest. 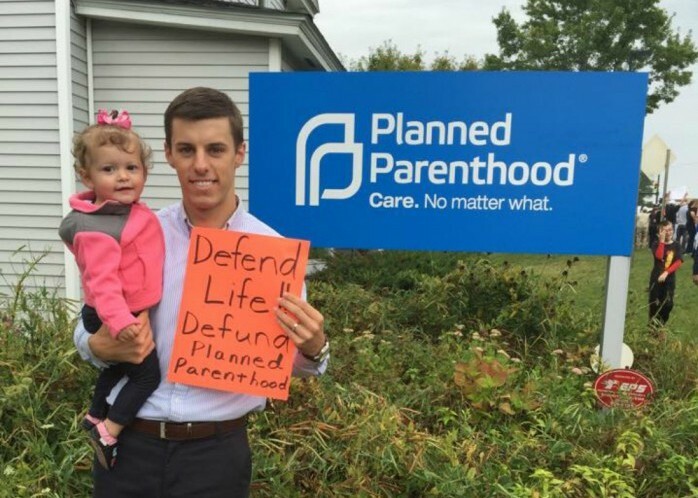 Last year the 26 year old Christian school teacher ran on a platform that included stopping Medicaid payments associated with the ACA, dropping protections for the LGBT community, and making good on a promise to defund Planned Parenthood. 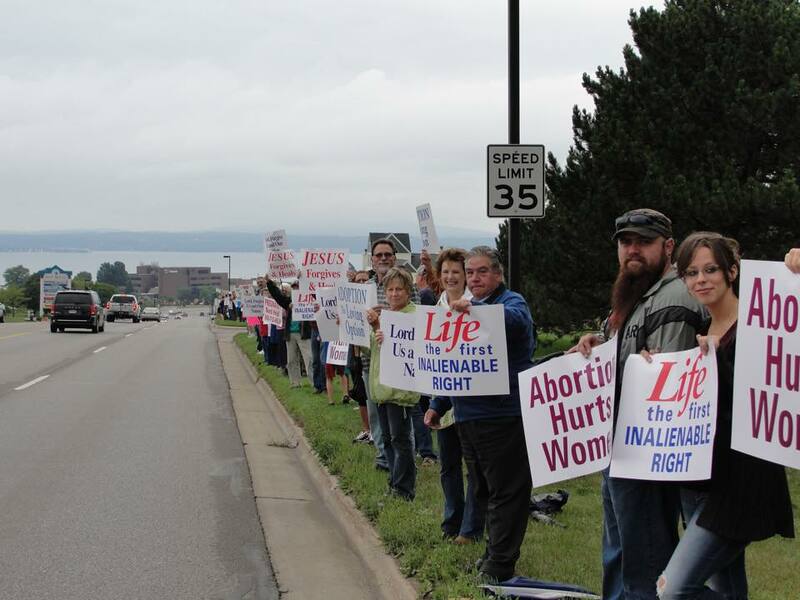 In August, he headed a protest rally in front of the Planned Parenthood clinic in Petoskey, bragging it up about putting an end to the evils going on in there. In November he won the election against Jim Page, the Democrat who ran on a platform of increasing funding to public education, increasing the minimum wage, ending Right to Work in Michigan, addressing environmental issues, and improving health care for all. He won it by attacking all of those ideas, using the defunding of Planned Parenthood as the icing on the cake. Lee Chatfield's wife has lived for years with her own perceived shame over an abortion. She has that right. It's her life. But when she joins her husband in his attempts to shut down Planned Parenthood, an organization celebrated for its work in helping millions of women with their reproductive needs, she infringes on the rights of other women. While Planned Parenthood doesn't advocate abortion as the only outcome for an unplanned pregnancy, they do add it to their list of options. Options. They're not in the business of killing babies. They don't sell baby parts. They don't deserve these wrong-headed, dishonest attempts to shut them down. Stephanie Chatfield didn't deserve to be outed over her very private decision to have an abortion, either. I hope, when all this blows over, she can empathize with women finding themselves in her shoes and can finally understand that our lives cannot be subject to someone else's decisions about them. Out of misery comes mercy.